any data recovery experts here? Discussion in 'Mac Basics and Help' started by patent10021, Nov 20, 2014. Dropped WD My Passport Ultra drive. Now not seen by Mac. EDITED: Please read my last post. Drive light is blinking the Mac is trying to read it but no go. Data is still obviously on there but I might have busted a piece that prevents reading. The data wouldn't simply disappear. What are my options? How would I take it out of the enclosure? These smaller Passport enclosures have no screws or anything. Based on this youtube video, it does not look like the WD My Passport Ultra internal HDD has a SATA connection like typical HDDs. I'm not sure what connection it uses but you're in a bit of tough luck in your hands. I can confirm that the WD My Passport drive do not have a SATA connector inside the enclosure. They have the USB connector integrated in the PCB, so removing the HDD from the enclosure won't help getting the data back. Called a recovery place and they think it will need to be converted to SATA so they can flush something to do with the sectors then convert it back to USB to be able to image it. Also it might need a header so it will cost at least $700.00 and more if it needs a donor drive. I can do this myself if I have the tools. I can buy the same drive to use as a donor, the USB to SATA adapter and of course the software. If Someone could just advise me as to what software I should use and a well-known USB to SATA adapter etc I can do this. LED is blinking like it does when it's reading and it sounds like it's spinning but the Mac isn't seeing it. Is it easy to convert this WD USB HDD to SATA for recovery? Technically could I just remove the platter and put it in a donor HDD? Or since these WD Passports are encrypted that wouldn't work? After taking my HDD out of the freezer WD Drive Utilities software actually saw my HDD. Before it didn't even see it. I took a screenshot quickly incase by the time it heated up the utility wouldn't see my HDD again. It says there are no volumes. Is that super bad? EDIT: Now it's making a mouse-like click sound about once every minute. The company I contacted has this on their site. Here at HDD, we have a tremendous success with recovering data from Western Digital Passport hard drives. 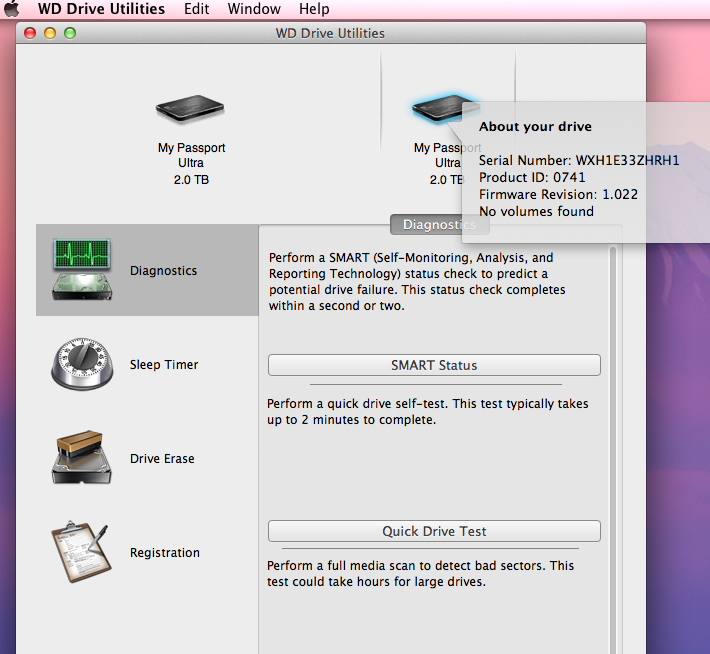 WD drives that come with proprietary USB interface can be converted into SATA. This conversion is our in-house developed technique that allows us to use traditional methods of firmware manipulation on deffective hard drives. Consequently, we are able to use most powerful equipment and maximize our recovery results. Is it really that difficult to convert? ok two new things have happened since I removed the HDD from the enclosure. OSX Disk Utility actually sees it. Before it didn't. The HDD I'm trying to fix is called GREYULTRA. Should I be racing against the clock and trying to clone this image with Disk Utility ASAP? ok So I went out and got a Seagate 2TB HDD to image the HDD with Disk Utility but unfortunately I got error 252. DataRescue is telling me to clone but I have Carbon Cloner and it doesn't see my HDD even though DiskUtility does. If this is your only copy of the data and it's important to you, pony up the $700 and get it recovered by an expert. Your continued fiddling only puts the data more at risk of permanent loss. Use it as an expensive lesson on why you need a good backup strategy. But it would be nice if I could to get the other data for convenience sake. Not worth the pony. I'd rather learn how to do it on my own. Other people learned it so I can learn it. It could be damaged heads, platters, or the arm (actuator?) that sweeps across the platters. If you feel comfortable doing "drive surgery", then have at it. I believe ticking sound from HDD is bad news. It's probably damaged from the drop. Were you able to clone it using disk utility instead of CCC?